 Single-sided column capacity: up to 6,960 lbs. Double-sided column capacity: up to 13,920 lbs.  Arm capacity: up to 1,300 lbs. 12-gauge steel. Arms adjust on 3" centers. 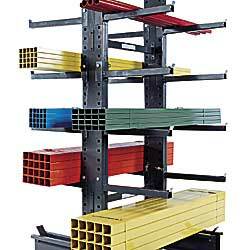 Assemble as either a single rack or a continuous unit consisting of any number of uprights. SELECTED MODELS IN STOCK. Others FOB ILLINOIS. *Maximum capacity for double column is twice value shown.